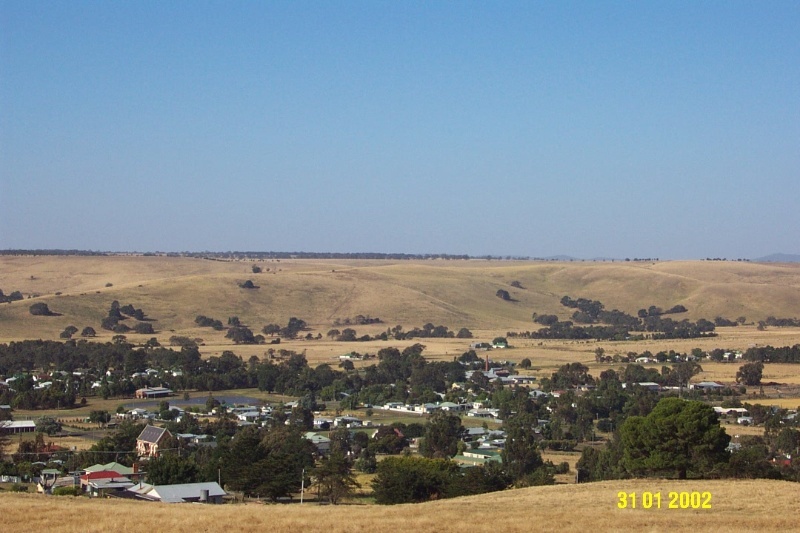 Queen's Park is located on the northern side of Bryans Creek, bounded to the south by Bryans Creek, the north by the Parish and township of Coleraine boundary, and to the east and west respectively by Gage and Henty Street extensions. The area of the whole reserve is ninety acres, including the now Gazetted Silvester Oval. Queen's Park was proclaimed and planted out to honour and commemorate the Golden Jubilee of Queen Victoria. Queen's Park contains a mixture of indigenous remnant Eucalyptus, many mature specimens of Ulmus procera (English Elm), Quercus robur (English Oak) and different types of Pines. There are also small basaltic outcrops (apparently used by important artists working in the area in the nineteenth century) and the remains of clay pits used in the early brick making industry. Queen's Park is of aesthetic and historical significance to the township of Coleraine and the Southern Grampians Shire. Queen's Park is of aesthetic significance for the many plantings of mature native and exotic trees which form an aesthetic backdrop to the township of Coleraine. It is the largest open recreational space in Coleraine, forming part of a series of recreational spaces along Bryans Creek. Queens Park is of historical significance to the township of Coleraine as it is representative of the importance placed on monarchical achievements in the nineteenth century. It is important historically as a commemorative memorial to Queen Victoria's Golden Jubilee. The mature exotic specimens are in poor to fair condition, the mature indigenous trees are in fair to good condition. There is some potential for archaeological excavation to discover the original layout of the park. Queen's Park is a ninety acre reserve located on a sloping hillside to the north of the township of Coleraine. 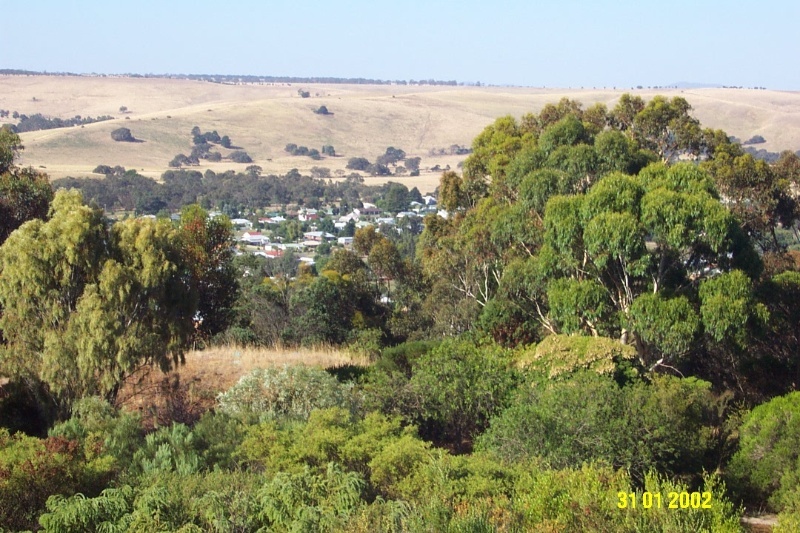 The original Queen's Park permanent reserve covers all of the land from the Township and Parish boundary to Bryans (also known as Koroite) Creek, and from the extension of Henty Street to the east and the extension of Gage Street to the south. Although this area was laid aside as a public park and was planted out with trees and shrubs for the Queens Jubilee, at some stage, it has gone into decline. The land is almost unrecognisable as a public park, as it has had livestock grazing it heavily for upto 70 years. The majority of the plantings were undertaken as part of Queen Victoria's Jubilee Celebrations in 1878. Large numbers of Ulmus procera (English Elm) and Quercus robur (English Oak) were planted across the site. Along the southern boundary of Bryans Creek, there are five mature specimens of Quercus robur, and a scattering of specimen plantings of Ulmus procera throughout the south eastern part of the reserve. Several Pinus radiata (Monterey Pine) are planted in lines stretching north-south up the hillside, although many of the trees in these rows have died, leaving small groups of parallel plantings of these pines. Near the summit of the hill there is a consciously planted Pinetum, very popular in the late Nineteenth Century. This pinetum includes specimens of Pinus radiata (Monterey Pine), Pinus nigra. Var Maritima (Black Maritime Pine), Pinus Nigra (Black Pine), Pinus montezuma (Montezuma pine), Pinus cembroides (Mexican nut pine), Pinus halapensis (Aleppo pine) and Pinus caneriensis (Canary Island Pine). There is also what appears to be a changing box or toilet located in dense buckthorn underneath these pines. The buckthorn may have been a hedge planted around the structure for privacy many years ago. Throughout the Pinetum, Ulmus procera suckers have created a dense impenetrable understorey, leading to the demise of many of the mature Pinus specimens. To the north west of the site, there are what appears to be a double row of Quercus robur which stretch down towards the reserve entrance from a granite peak near the summit. These trees do not form a proper avenue, but create a definite aesthetic impact on the landscape as they follow the contour of the hillside in a sinuous line. There may have been a walking or coach track located between these trees in the early part of the nineteenth century, as they are purposely planted in this avenue like formation. There are many indigenous Eucalyptus camaldulensis (River Red Gum) throughout the site, the majority which have been allowed to remain while other exotic planting has been undertaken. There are also some native Australian plants which have been consciously incorporated into Queens park reserve. These include Acacia dealbata (Silver Wattle), Eucalyptus globulous (Blue Gum) and Eucalyptus leucoxylon (Yellow Gum). There have been boundary plantings of Ulmus procera on the western boundary with Silvester Oval which have suckered to form a dense copse. Specimens of Fraxinus excelsior (Common Ash), Acacia dealbata (Silver Wattle), and a variety of different Prunus and Crataegus species, may also have been planted in 1887 to commemorate the Golden Jubilee of Queen Victoria. They now exist as single mature specimens or as a number of younger trees in clumps where the mature specimen has died. The Queen's Park reserve includes a granite outcrop to the extreme north west, at the summit of the slope. This granite outcrop appears to be one of the main vantage points which early artists who made depictions of the district. The view looking north along the Kononwootong Valley is clearly evident in the works of artists who painted in the area, such as Buvelot, Clarke and von Guerard. It appears that there is also a disused carriageway which winds around the western side of the site towards the granite point lookout. The original reserve also included the land which is now known as Silvester Oval. This is an important sporting facility for the township of Coleraine, with a large oval, netball courts, change rooms, toilets, outdoor seating, clubrooms and kitchens. There have been a number of plantings in the reserve in the past fifty years, especially to the north east of the site. The plantings include a western boundary of Cupressus macrocarpa 'Horizontalis' (Monterey Cypress), and to the north of the site, specimens of Eucalyptus globulus (Blue Gum) and Eucalyptus maculata (Spotted Gum), as well as Phoenix caneriensis (Canary Island Palm), Cupressus arizonica (Arizona Cypress), Corymbia ficifolia (Red Flowering Gum), Acacia dealbata (Silver wattle), Pinus radiata (Monterey Pine) and Crataegus laevegata (May Hawthorn). Queens Park is in very poor condition, and if total loss of the fabric is to be avoided, urgent intervention is required. The integrity of this site continues to be compromised by grazing pressures and lack of maintenance. The Silvester Oval is in good condition, and retains a high degree of integrity to the 1940s additions. The integrity of the Queens Park has been reduced by the loss of many trees and shrubs due to past grazing practices and lack of maintenance. Silvester Oval has retained its integrity to the 1940s additions and plantings.